"Hartzogs music practically knocked me out of my chair. Its hungry, relentless musical energy. He has taken a wide range of influences from funk to classic rock to folk and brought them together for one big jam." 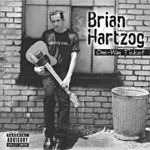 "If youre dead tired of the rock on the radio, and bored by the rounded soft corners on modern funk, Brian Hartzog may be the shot in the arm youve been looking for." The songs on this CD are pretty varied: there's a spoken word song, a Beatlesque song, some Jimi Hendrix-style guitar work, some Red Hot Chili Peppers sounding stuff, a Prince-ish tune or two, etc. I grew up listening to classic rock radio (Beatles, Jimi Hendrix, Led Zeppelin) and funk (Prince, James Brown and Parliament)...in addition to the pop and hip hop that blares at us through our radios. On this CD, wear my influences on my sleeve. It's not that it sounds like I'm copying them...it sounds more like I dehydrated them, poured the powder into a pot, added some chicken grease, mixed in some angst, and sopped it up with some cornbread. I call it funk-and-roll...most people call it alternative.